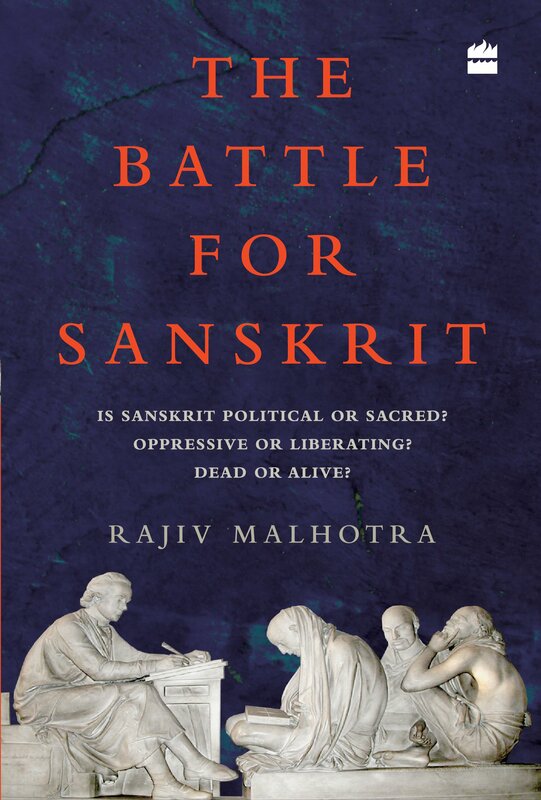 Rajiv Malhotra responds to some frequently asked questions in the forum on his new book that is being published by Harper Collins, India. The book can be pre-ordered at Amazon. Is it a book on Sanskrit? No. It is NOT a book on Sanskrit. You will not learn any Sanskrit reading it. Nor will you learn the glories of Sanskrit. There are already many nice books for these topics and many experts far better qualified than me. Is it the same thing more or less as in your prior books? No at all. I do NOT examine any scholar here that I have ever examined previously. Nor are the serious issues here the same as those discussed in my earlier works. Chapter 1 summarizes the main issues very clearly. The Conclusion chapter lists the 18 debates/discussions that are needed going forward as a result of this book's findings. Bottom line: You must read it and not start commenting with your opinions based on prior information and knowledge you have. Is it about Sheldon Pollock? No. It is about a school of ideology that I have termed "American Orientalism". First I explain the earlier European Orientalism (which I call Orientalism 1.0) and then I explain how this new Orientalism 2.0 is a more evolved/sophisticated and dangerous version. It shows how we are being re-colonized & digested while we are imagining that we are being promoted. Why so much emphasis on Pollock then? To sharpen my analysis, I never want to discuss in abstractions, but in concrete terms dealing with concrete writings of specific pioneering thinkers. So I always pick one or two top leaders of a given school of thought and focus on that person(s) to make my points. I use Pollock as the leader of this genre, who is in fact the most important Indologist in my opinion that we must study and engage today. Hence, Pollock is a window into a wider phenomenon. Is this anything to do with Wendy Doniger? Not so. Pollock is not at all like Doniger. He is a far deeper, more accomplished Sanskrit scholar. His criticisms of the Sanskrit texts are not at all based on Freudian psychoanalysis while Doniger's work is based on that. Are you attacking Pollock? Not at all. I introduce him in detail as a solid scholar. I disagree with his premises, methods and conclusions because these are counter to how our tradition sees itself, especially those who are devout practitioners. But I am respectful of him personally. He is a product of his training and his background, and I am approaching this as an "insider" who is invested in the tradition while he is an outsider with an entirely different investment. What are your main issues with Pollock and his school? I criticize his determination throughout his work to remove the sacredness, his determination to focus on social oppression which he claims is at the heart of the Sanskrit texts, and his attempts to see our sacred texts as designed for political exploitation. The byline under the title on the cover, "Is Sanskrit ...." says it all. These three issues are each very serious and impact the way our civilization has been misrepresented. Do you want Pollock and his team to stop their work? Not at all. I believe in intellectual freedom. Nor can I compel them to alter what they do, even if I were to try. It makes no sense to ask the opposing cricket team to stop playing so hard against our team. Furthermore, such churning of opposites is the way manthana works, so it can also be useful for us to face his challenge. In that case, what is your desired goal in writing this book? My call to action is to the insiders, the traditional scholars, the leaders of our dharma institutions today. They need to wake up, get out of their isolation sitting in silos. They must engage in serious purva-paksha and uttara-paksha. I can with confidence that till now NOBODY IN THE TRADITIONAL SIDE HAS EVER STUDIED POLLOCK OR THE REST OF HIS SCHOOL AND GIVEN A RESPONSE. I know this from numerous traditional scholars I consulted in the course of my own research. Why must I have to do this work while hundreds of scholars with great qualifications and prestigious positions never bothered to do so? Why have our traditional never bothered to do this kind of work? I address this issue in a specific section of the book, titled, 'Where is the home team?' Later on, in the final chapter, I also have a section that comes back to this issue. It is titled, 'The death of purva-paksha', in which I explain the history of the decline of our purva-paksha tradition. Why did we fail to do this purva-paksha to early Christians, later Medieval Christians after Vasco da Gama, Islamic invaders, more recent Marxists and postmodernists? What caused our "experts" to hide under the fascade of being introverted? Why this capitulation? I offer my explanations and also a psychological model of our vulnerability. This insight can then lead to a remedy that I suggest.